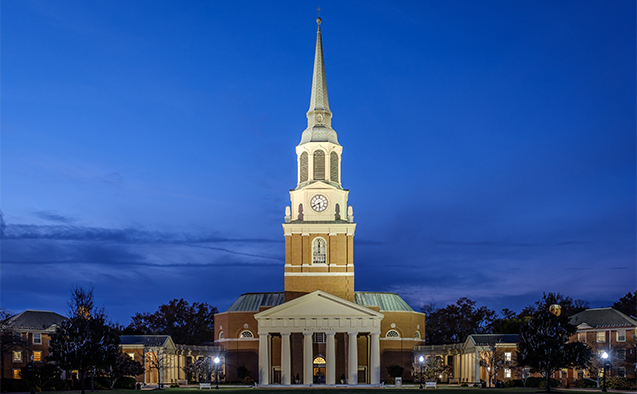 Wake Forest University will replace the light fixtures that shine on the University’s iconic Wait Chapel Bell Tower with new energy-efficient LED fixtures that will allow deeper and more vibrant colors for special events and other occasions. During installation of the new lighting system, Wait Chapel’s Bell Tower will be unlit. Facilities & Campus Services anticipate installation will begin October 5, and the lights will be off for approximately three weeks. Operated more safely and effectively from a central master panel that is programmed with options for scheduling, dimming, and customizing colors. Floodlights have brightened Wait Chapel since its construction in the early 1950s. In 1981, the original lights were replaced with the current metal halide light system.